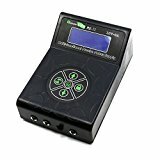 ​These best tattoo power supply reviews will help you find the perfect power supply that will fit all of your needs. ​Each has something they are the best at. Some are the best power supply for a tattoo artist on a budget while others have all the bells and whistle that you could want in a tattoo power supply. This all-digital power supply comes with a blue LCD display that shows you the Voltage, Duty, Speed, and Follow Through. It also comes with a stopwatch to tell you how long the session has been! Not to mention 6 savable presets. It can run from 0-18v and has Overload protection built in. The power supply comes with two different mounts, a clip cord, and a foot pedal. 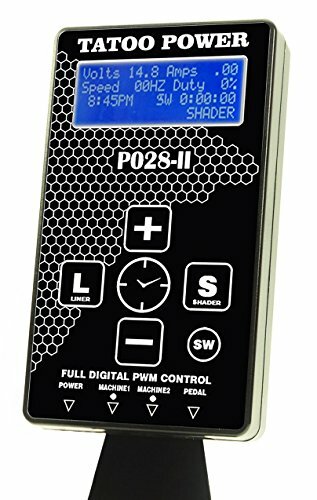 What Makes This the Best Tattoo Power Supply? This tattoo power supply comes packed full to the brim with great features. It comes with two-foot pedal modes: conventional and a maintained mode that keeping the tattoo machine on. It’s small size and unique shape allows it to easily be bagged, which is great for sanitation. The six savable presets is really great for the tattoo artist that has a lot of tattoo machines in their arsenal. Plus, you can plug in two machines and switch back and forth between the two at the push of a button! It’s made entirely out of plastic, even the RCA jacks. You would like to see some metal on such a high-quality tattoo power supply. Overall this is the best overall tattoo power supply. It’s lightweight and comes with a ton of helpful features. This all-digital power supply comes with 4 memory channels, so you can save your settings for your top four favorite tattoo machines. It also lets you run voltage tests, current tests, duty cycle tests, and a speed frequency test. Has both a mode for rotary machines and coil machines and comes with a year-long warranty! What’s So Great About This Tattoo Power Supply? Being able to save your top four tattoo power supply settings is really convenient. And ​because it's all-digital, it comes with tools that really help us understand if our tattoo machines are running as best as they can. It comes with a self-protective device that will help prevent you from doing any damage to not only the power supply but to your tattoo machines as well. You have to be aware of what mode you have this tattoo power supply set in. If you run a rotary tattoo machine in coil mode after 1 minute the power supply will shut itself off. 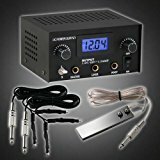 Overall this is the best tattoo power supply for those looking to make the jump from an old traditional tattoo power supply to a modern all-digital power supply. This Monster Point Tattoo Power Supply allows you to hook up both your liner and your shader at the same time, and makes switching between the two as easy as flipping a switch! It comes with a fully digital screen and is able to run anywhere from 1.5 volts all way to 18 volts. 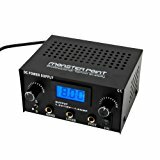 Why ​Is This the Best ​Budget Tattoo Power Supply Unit? 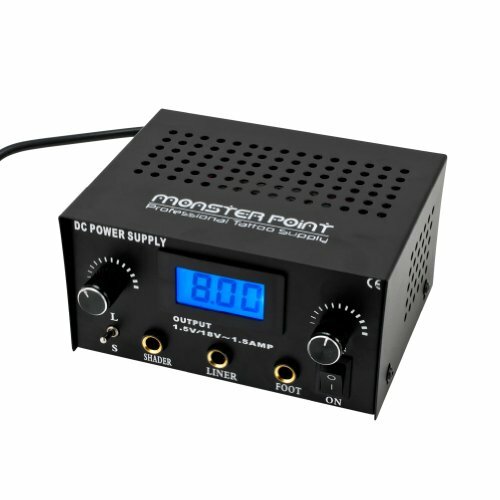 The Monster Point MP140 Tattoo Power Supply is the best tattoo power supply for the tattoo artist on a budget. It’s a decent little machine that you’re able to pick up for a really good price. It comes in two different colors: black for the more traditional look and red to really stand out. Some people experience the voltage jumping a little bit on them which can be a bit of a problem. Overall this machine is great for someone on a budget or just looking to get a backup tattoo power supply. Its dual capability does come in handy when needing to switch between two tattoo machines. This Gothobby Pro Tattoo Power Supply is as inexpensive as it gets! Not only do you get a power supply, but you also get two clip cords and a stainless steel foot pedal. This tattoo power supply is powerful and operates trouble-free! Full digital LCD display, and dual machine capability. 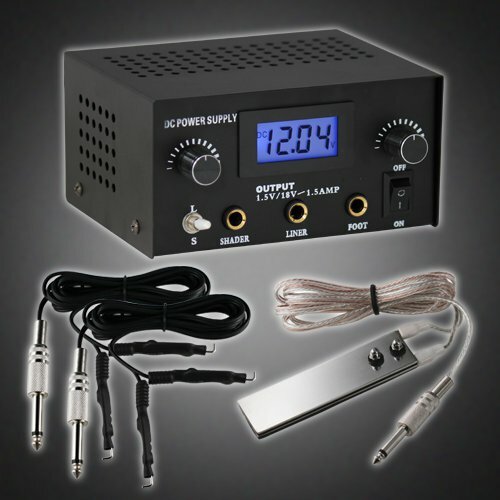 This tattoo power supply is powerful and runs ​smoothly for extended periods of time. One of the things customers really love about it is the foot pedal that it comes with. The pedal is really light and easy to push down. The power supply itself is really light making it easy to carry around with you. 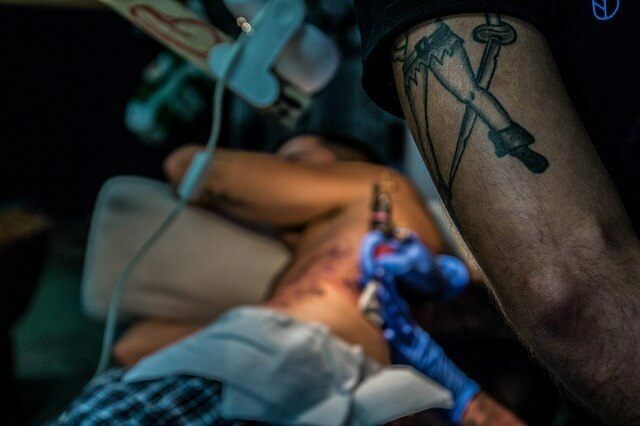 Some people experienced needing to run their tattoo machines at a higher voltage than they normally do. Overall if you don’t have a lot of money to spend, this will be the best tattoo power supply for you. There are definitely better power supplies out there, but for this price, it’s hard to beat. When you are looking for the best tattoo power supply a lot has to come down to what you need it for. Do you want it to just do tattoos with? Or do you want it to help you really fine tune your tattoo machine? If you just want one to tattoo with, a bunch of bells and whistles won’t be something you need, but if you want it to help you tune your tattoo machines a power supply that tells you the speed and duty cycle will be the power supply that you will love the most. Also, if you prefer to tattoo with a rotary tattoo machine then an all-digital tattoo power supply will be the best for you. You will be able to control everything a lot better than you would if you were using a traditional tattoo power supply. It’s going to depend on what you want out of the power supply, but whether you want something simple or complex these four tattoo power supplies will give you anything that you could possibly want!